Ground anchors are arguably the best security devices available for bikers. 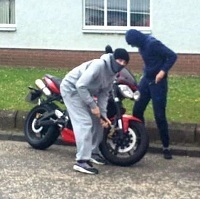 Disc locks and alarms are useful but they don’t prevent the removal of the whole bike. First choice for me is the one that is the hardest to remove. Ground anchors are not fashion items or glamorous accessories. The Mammoth Security Concrete-in Ground Anchor has no bolts and little metalwork to bash out with a hammer. The straight peg with swivel head slots into deep concrete and… stays there! 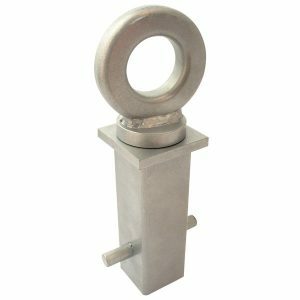 Second choice is the Mammoth Security Bolt-In Ground Anchor with a reassuring four bolts it is a simple yet highly effective design. Of course you can probably use ground anchors for non-motorbike use such as securing other valuable pieces of garden equipment or locked tool boxes. The obvious locations for ground anchors are at the home and workplace where the bike is most likely to be kept for long durations. In the absence of security guards we can’t watch our bikes all the time and much can happen over several hours for the out-of-sight motorcycle. According to published crime reports 80% of thefts occur at the owner’s home. In a bid to reduce out of control motorcycle thefts local councils are considering installing more of them in public parking locations. In the home they can be placed in garages or driveways. Speak with your company and discuss a suitable location for one if you ride to work on a bike. You’ll also need a lock and chain so check out our reviews of the best models available. You may wish to consider installing more than one ground anchor for front and back wheels. They are reasonably priced and anything that protects thousands of pounds worth of motorcycle and keeps your insurance premiums low is a good investment. Unlike other security devices which simply attach to your machine the ground anchor requires a little installation work and some drilling. Usually this is basic DIY level and no more complex than routine bike maintenance. The bolts and screws come with the package. For installation find a good solid concrete floor at least 10cm deep. Consider a wall if the brickwork is strong enough. Old orange brickwork is unlikely to survive. You’ll typically require 16mm drill bit to reach about 75mm deep. The basic install involves screws placed into rawl bolts and tightened with an allen key. To avoid unscrewing by thieves the tops are made tamper proof by hammered in ball bearings and sealing caps. Install your ground anchor out of the way where you won’t trip on it or damage a car wheel. You should still be able to anchor the bike by chain. 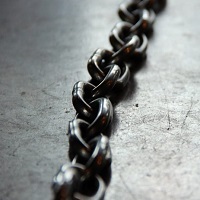 It is important after all your hard work to place your chain in a suitable location. 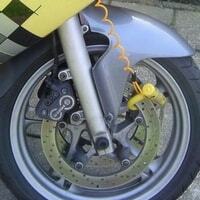 Rather than a removable wheel try locking it to the bike by a frame rail. A raised chain is harder to break than one which can be hammered against the ground. .
Here’s a good wall installation video to help you. And heres one for setting an anchor in concrete. The material into which you mount your anchor is as important as the material of the anchor itself. Tarmac and other soft ground surfaces will not provide the resistance to prevent extreme forces from towing or pulling your anchor from its mounting. Think about the prevention of cutting, drilling and heavy hammer impact. Concrete is the surface of choice especially if it is 10cm or more in thickness. Brickwork is not as good as a heavy blow can destroy the surrounding area for removal of the mount. The metalwork of your anchor should be steel or hardened steel which is less brittle than alternatives. Any attempts to remove an anchor mount are likely to be prolonged and noisy; a well-installed and high quality model goes a long way in stopping such attempts. The Mammoth Ground Anchor sinks seven inches/18 cm into new concrete. The exposed 2.25inch/ 5.7cm steel ring provides a low-profile but heavy-duty anchoring point. Its unique feature is a swivel head allowing greater maneuverability when fixing chains or other securing attachments. Hardened steel helps protect it from heavy blows and allows weatherproofing for outdoor use. This product carries the Thatcham security approval rating and the Sold Secure grade – an independent test to resist determined attacks by thieves. Both approvals are recognised by insurers who may offer reduced premiums for the product’s users. The unique feature of the Mammoth is a twin layer design forcing the would-be thief to deal with another section of hardened steel. The unit is fixed into the ground with a reassuring four-bolt installation. Ball bearings are supplied for hammering into the bolt heads rendering them impossible to remove with conventional tools. Compared to other models the Mammoth is relatively small but it’s double layering of hardened steel makes it a formidable security device both in and outdoors. The Anchor Force represents a higher specification than other models with double layering and four installation bolts instead of two. Hardened steel further enhances the quality of this Secure Gold approved unit. Consideration is needed for installing. The four bolt option may make it unsuitable for older ‘red-brick’ wall mountings. Despite the photo the Mammoth Flip Ground Anchor requires four M10 bolts to keep it secure. The unique feature is its fold-down hasp. This makes it inconspicuous when not in use and reduces the chance it tripping you up. The heavy-duty steel plate bolts into a concrete surface. Unlike many other models it has a curved ring allowing a smoother fit for your chain. Two, heavy-duty, rawl bolts secure the Oxford Brute Force Ground Anchor to the floor of your garage or driveway. Its design also facilitates wall-mounting. The allen key and ball bearing option guarantees a tamper-proof unit following installation. The Brute Force is a simple and low profile design and easily accommodates a range of heavy-duty chains and locks. You get what you pay for so buy the best you can afford. Make a ground anchor part of a mini ‘security field’. An additional alarm with built-in motion sensor will alert you to any burglary attempts inside your garage. Read our review of the best disc locks here. Remember, they’re out there looking for an easy target. Don’t give them one.